The WaterWick® gravel vein helps water drain through a variety of soil conditions. Excess water moves horizontally to low drainage areas, providing consistant playing conditions in all types of weather. 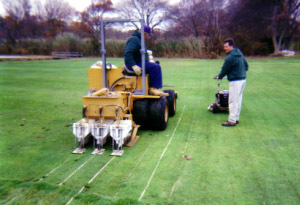 The WaterWick system incorporates multiple vibratory plow blades that gently slice into the turf. As the turf is drawn apart, a gravel vein is injected into the opening to create a permanent underground aqueduct that carries away excess water to eliminate puddles and soggy areas. Improves drainage on virtually all surfaces. days only. Treated turf can be ready for play immediately. growth, prevents disease and insect infestation. More affordable and less intrusive than traditional solutions. by 8" to 12" deep to prevent root, rodent or insect intrusion.